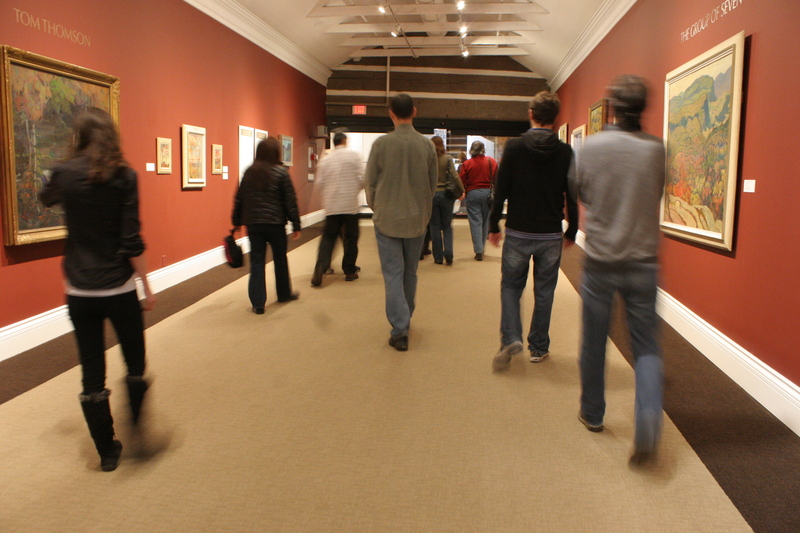 Since November 4, 2013, the McMichael Canadian Art Collection has been the Monday stomping ground for five talented youth. Members of Kerry’s Place Autism Services completed a six week partnership program with the organization. The LIFE (Learning Independence Through Facilitated Education) Academy Program is a course offered to youth aged 18 and up, which is a socially interactive experience that develops life skills for post secondary education, independent living and employment. Drawing from the surrounding landscape and history, each participant completed a portfolio of vibrant works worthy of exhibition. The program was taught by McMichael educator Christina Kerr, and Emmanuel Elkabas-Besnard, an instructor from Kerry’s Place and a professionally trained artist currently pursuing a Fine Arts Degree at York University. It was a great opportunity to merge teaching methods in a free-flowing environment against the stunning winter backdrop of the Humber River Trail. Each week, the students intently worked on rough sketches and paintings. They also visited the gallery to experience the current exhibition You Are Here: Kim Dorland and the Return to Painting. Students had the opportunity to hear from the Toronto-based artist during a gallery talk, where they learned about his painting techniques and the influence of Tom Thomson, members of the Group of Seven, and other Canadian artists on his own work. Scott and Daniel work on their final paintings during the winter session of the LIFE Academy program at the McMichael on December 9, 2013. On Monday, December 9, the participants of LIFE Academy at the McMichael celebrated their final day by completing their portfolio pieces, inserting them into customized canvas bags. The group listened to Electro-Jazz, The Tragically Hip and St. Germain compilations during each brushstroke and pencil sketch. Kerr and Elkabas-Besnard awarded each participant their own certificate of completion. Before heading out into the brisk winter weather, the artists made a toast with piping hot chocolate and cookies. It was a sweet ending to an awesome program that created new friendships and inspired innovative techniques. Who knows? Maybe we’ll see these pieces on our walls someday, parallel to Thomson and the greats. The LIFE Academy gather for a group photo in front of the McMichael sign on December 9, 2013. From left to right: Stephanie Lee, Christina Kerr, Rebecca Ribchester, Daniel Ciccarelli, Tommy Deonauth, Emmanuel Elkabas-Besnard and Scott Lee. Don’t you just love the crisp crunch sound of yellow, red and orange leaves beneath your feet? What about the cones that fall from huge pine trees, each unique like a snowflake, but a season early? Or maybe it’s that fresh smell in the air, clean and cool. Is there a word to describe all of this at once? Yes – it’s Fall – an inspiring season of natural aesthetic and transformational change. Fall at the McMichael is an extraordinary experience. Whether you’re entering through the main entrance or walking on the Humber River Trails, the spirit of the Group is Seven is present and guaranteed to excite your senses. That’s what participants of Explore Autumn encountered on Saturday, October 19. Watercolour leaf rubbings: made by tracing the shape of oak, maple and birch leaves in various shapes and colours with an accessible chopstick tool. The veins of each leaf were sketched to add texture before participants added a layer of colour and a spray of water before “stamping” the shape on craft paper. Vibrant watercolour marker paintings: Participants painted nature scenes on a texturized burlap canvas by using smooth markers in vibrant hues. Clay scenes and sculptures: The ultimate tactile activity! By choosing from a vast palette, participants molded clay into animals or produced pictures inspired by surroundings and everyday life. Each application offers the choice of several tools, shapes, stamps and colours. You can change the density of the mark your paintbrush makes or the texture of a pencil. Perhaps you wish to add a flower to your image – there’s a tool for that! Parents joined to produce their own masterpieces. Artists also sent their work as an email attachment directly from the application. In the new year, we’ll host our next program, Canadian Mosaic, where we’ll learn about mosaic techniques, piece by piece. We hope to see you at our winter program! For now, enjoy autumn before the snow falls. Mother Nature Family Art Tour – Register Now! multi-sensory storytelling session that will engage participants’ imaginations. 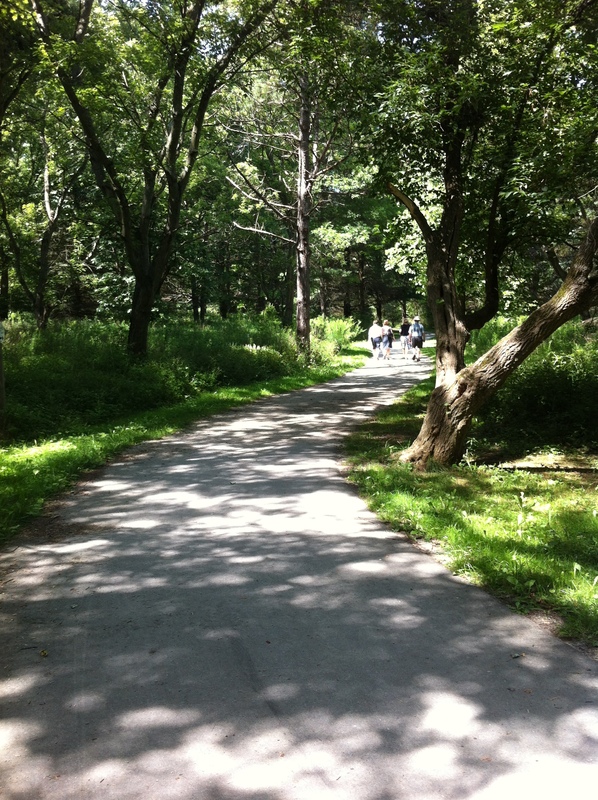 Mother Nature Accessible Art Tour is a great way to spend the day with mom or the whole family! For more details, visit the McMichael website.